On the mornings of Monday and Tuesday I attended the hearing in the House State Affairs Committee on HCR 21 and HCR 22. Testimony on the resolutions was interrupted when testimony for two other bills went longer than expected and the committee members were scheduled to be in the House chambers. The two resolutions involve the transfer of federal lands to the the State of Idaho. HCR 21 is a resolution that would authorize a “Legislative Council to appoint a study committee to ascertain the process for the State of Idaho to acquire title to and control of public lands controlled by the federal government in the State of Idaho.” They would supposedly investigate all of the aspects of this process and also investigate subsequent sale of these lands. While the sponsor of the legislation, Lawrence Denney, and proponents of the bill vigorously deny the claim that the purpose of the transfer of public lands is to sell them to the highest bidder once they have been transferred, the Idaho Constitution provides for just that. 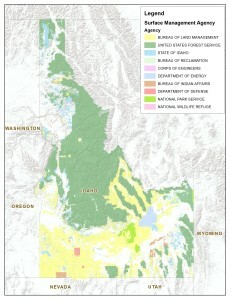 Idaho is composed of 63% federal lands. Primarily, in the mountainous and forested regions the land is managed by the US Forest Service (USFS). In the arid, lowland areas the land is managed by the Bureau of Land Management (BLM). 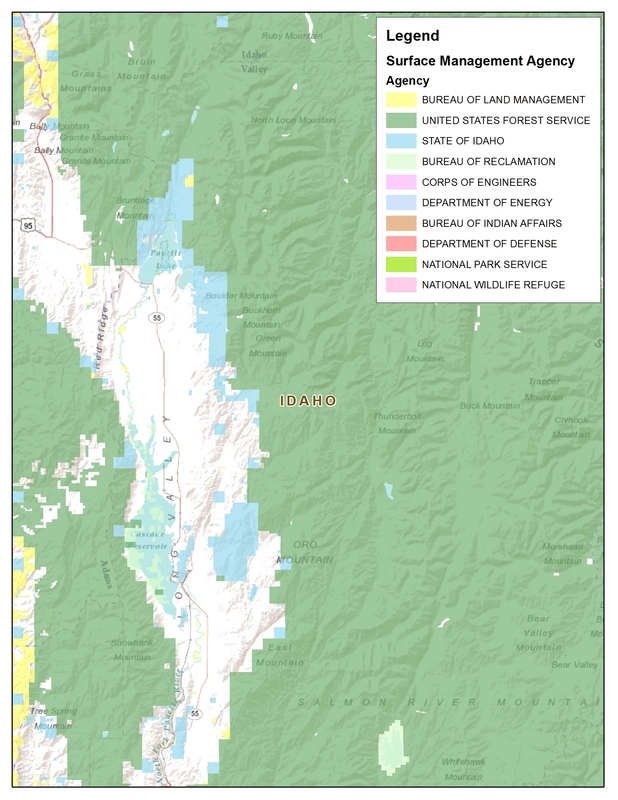 Interspersed within federal lands are state lands managed by the state of Idaho which were given to the state by the federal government in the first place. As part of this transfer the state had to disclaim all rights to the land. 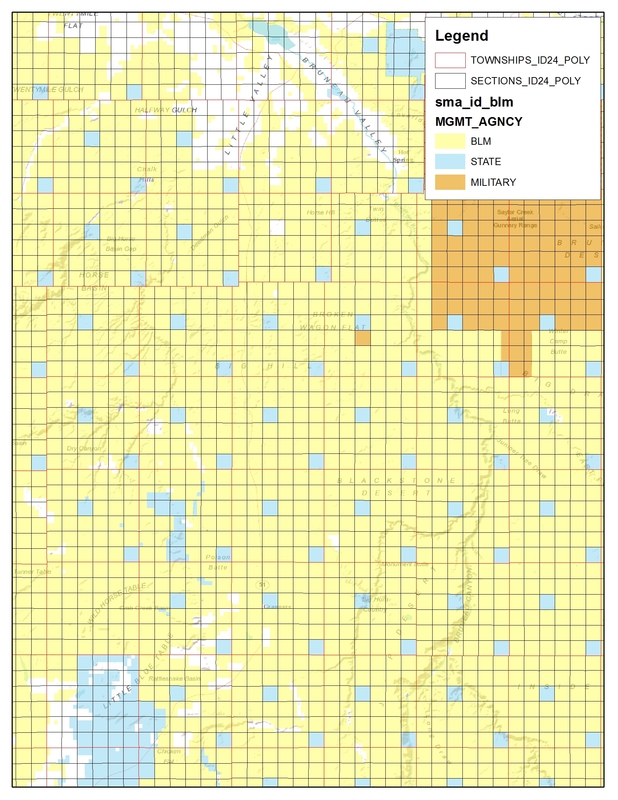 If you look at a map of areas with large, contiguous areas of federal land you will see that there are sections of state land evenly dispersed throughout. Commonly sections 16 and 36 of each 36 square mile township was given to the state of Idaho to provide maximum revenue for Idaho schools. Since statehood there have been many swaps made over the years where state lands in very remote areas were traded for federal lands close to logging communities so that they could more economically be logged. There has been a very long history of trying to get the federal government to hand over federal lands to the state. In fact, former Senator Larry Craig once told southern Idaho ranchers that the BLM lands that they use would become theirs someday. It is clear that the end game of this plan is to transfer public lands directly to private individuals and corporations despite claims that it isn’t. One of the primary arguments that proponents claim is Idaho would make a profit if federal lands were transferred to the state. They dream of being able to maximize logging and grazing revenue to pay for schools while, at the same time, they totally ignore the burden this type of management would put on wildlife, clean water, and recreation. They also completely ignore the cost of such a transfer to the state. Idaho is a welfare state. In other words, for every $1 that Idaho pays in federal taxes, it receives $1.21 in federal funding. This is primarily due to the costs of managing public lands and enforcing the laws and regulations associated with them. Proponents claim that Idaho is more capable of managing its lands. What does that mean? Well, when you compare the mandates for the agencies that manage federal lands and that of the agency that manages state lands, you will see that these mandates contrast greatly. 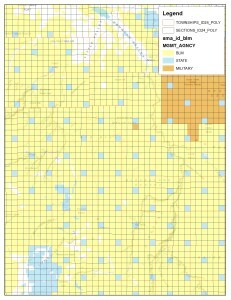 The USFS manages forest lands under the National Forest Management Act (NFMA) of 1976 and the BLM manages lands under the Federal Land Policy and Management Act of 1976 (FLPMA). Both agencies are required to analyze projects and allow public participation under the National Environmental Policy Act (NEPA) and these decisions and implementing regulations are subject to review by the federal court under the Administrative Procedures Act (APA). Federal lands must be managed in a way that protects clean water, wildlife, scenic, and other values. They are not managed strictly for economic values. In contrast, lands managed by the state have none of these requirements. The only mandate for state lands is that they be managed so that maximum revenue is received for Idaho’s schools. That means that there is no public process and decisions cannot be challenged in court except if the decision doesn’t ensure that the maximum revenue is being raised. There is no requirement to manage the lands in a fashion that protects wildlife, water, or any other environmental value. Well, that’s easy, the land that was within the territory of what is now the state of Idaho was retained by the Federal government – after stealing it from the Native Americans – because none of the settlers wanted it when the state was settled. It wasn’t productive, was very remote, and – for the most part – didn’t have enough water or arable land to make it worth owning. It never was owned by the territory or the state of Idaho. That’s what makes it public, federal land, not state land or private land. It’s land owned and managed by the federal government and there is a different mandate for its management than state or private land. If you don’t understand the obscure reference click the image. Heh, heh, “Federal Uncle Angry Pants”, I like that. Well, my response would be that the reason that both the federal and state budgets and our economy are failing to provide for the welfare of the people is because we don’t tax the rich their fair share. They receive the most benefit from our system, they should pay and give back the most. Idaho is in a race for the bottom in many areas. Wages, funding for public schools, and very important health care programs have all been cut while at the same time the legislature is scrambling to give more tax cuts to the rich. Of course, this is antithetical to the right wing. They seem to think that we would get a free ride if we just privatize everything. Wright went on to refer to Article X, Section 4 and Article XXI, Section 19 of the Idaho Constitution saying that it was an obligation for the federal government to transfer lands to the state of Idaho even though they were never the property of the territory or state to the state of Idaho. Section 4. PROPERTY OF TERRITORY BECOMES PROPERTY OF STATE. All property and institutions of the territory, shall, upon the adoption of the constitution, become the property and institutions of the state of Idaho. Section 19. RELIGIOUS FREEDOM GUARANTEED — DISCLAIMER OF TITLE TO INDIAN LANDS. It is ordained by the state of Idaho that perfect toleration of religious sentiment shall be secured, and no inhabitant of said state shall ever be molested in person or property on account of his or her mode of religious worship. And the people of the state of Idaho do agree and declare that we forever disclaim all right and title to the unappropriated public lands lying within the boundaries thereof, and to all lands lying within said limits owned or held by any Indians or Indian tribes; and until the title thereto shall have been extinguished by the United States, the same shall be subject to the disposition of the United States, and said Indian lands shall remain under the absolute jurisdiction and control of the congress of the United States; that the lands belonging to citizens of the United States, residing without the said state of Idaho, shall never be taxed at a higher rate than the lands belonging to the residents thereof. That no taxes shall be imposed by the state on the lands or property therein belonging to, or which may hereafter be purchased by, the United States, or reserved for its use. And the debts and liabilities of this territory shall be assumed and paid by the state of Idaho. That this ordinance shall be irrevocable, without the consent of the United States and the people of the state of Idaho. Once you read and understand the sections that I have highlighted with bold you can see that, first, only property in the possession of the territory – which doesn’t include the lands that had not been disposed of to the state – were to be transferred from the territory to the state. Second, the state disclaimed all right to title to that unappropriated public lands lying within the boundaries of the territory/state. Third, this decision is irrevocable unless both the United States and the people of the state of Idaho agree to revoke it. Essentially, this rationale for transferring federal public lands to the state of Idaho is based on a misinterpretation of the plain language of the Idaho Constitution. On Wednesday morning, John Robison from Idaho Conservation League gave testimony in opposition to the resolutions. He pointed out the differing mandates that I explained above and said that under federal management there is much more opportunity for the public to provide input in the decision making process. He was grilled by the committee members and asked whether he thought that the federal government was doing a better job at managing its lands than the state could do. Robison essentially said yes and no, that under federal management everyone is allowed to participate in decision making and that collaborative processes are in place to allow local and public input on decisions but that there is no requirement for public input into state management of state lands. I’ll put the arguments about collaboration aside for this post but, needless to say, I find many of the collaborations have little value for protecting environmental values. Robison agreed that the process can be frustrating. Representative John Gannon (D-17, Boise) asked Robison how much the federal government spent on fire suppression last year. Robison responded that $240,000,000 had been spent just last year. This amount obviously varies greatly due to drought from year to year but just one bad year would likely blow the budget of the state since the federal government doesn’t provide funding for fire suppression on non-federal lands and last year’s cost was nearly 4% of the state’s annual budget of $6.3 billion. It would certainly mess up the natural resources budget of $258 million. Mike Medberry, a long time conservationist started his testimony by singing the chorus of “This land is Your Land” and made the point that federal lands represent a freedom not available to the vast majority of the world. They are owned by every American and are an important part of our state. He went on to describe the resolution as a piece of art, convoluted, inaccurate and bizarre. He asked that the committee kill the resolutions and not send them to the floor before we embarrass ourselves before the entire United States of America. He said it will never stand up to scrutiny of an objective national forum and that there are better ways to fund school children. When questioned by the committee he was asked whether he thought that he would have greater success lobbying people in a local setting or in Washington D.C.. He was also asked whether he had navigated the bureaucracy in Washington D.C. and whether he has had more success in affecting change or in Washington D.C. or in Idaho. He answered by saying that he understands that lands are essentially managed in Washington D.C. and that he has been more able to affect change in D.C. than in Idaho. Wally Butler, Range and Livestock Specialist for the Idaho Farm Bureau Federation (not a government agency but a non-profit group that claims to advocate for small family farmers), gave short testimony in support of the resolutions. Betty Richardson, a former United States Attorney for Idaho from 1993-2001, gave testimony in opposition of the resolutions. She pointed out that many of the law enforcement functions that the federal government fulfills would have to be taken over by the state in the event that it were to receive federal lands. This is a very expensive proposition that may far exceed the state’s abilities. She noted the many roles that the federal government plays in law enforcement and that the federal government defends must defend itself against lawsuits by land users and environmentalists alike. They also provide substantial resources for actions involving marijuana operations on public lands. She asked if the state would be able to afford to pay for these functions. She mentioned that payments in lieu of taxes (PILT), or payments that are made to the state because the state cannot levy taxes on federal lands, would no longer be paid by the federal government. She asked if the state would be able to afford to make up for these payments. After testimony was taken the sponsor of the resolutions, Lawrence Denney (R-9, Midvale) came to the podium to try to counter some of the arguments made against them. He tried to defuse the argument that the intent of the resolutions was to allow for sale of the newly acquired lands by pointing out that the state could only sell 320 acres to any individual or entity in a single year. Clearly there has long been motivation to acquire these lands and sell them to the highest bidder and there was no promise not to seek a change to the constitution that would allow just this. He then presented a letter showing the acreage of wildfire over the last 100 years showing a sharp increase in recent years. He then tried to correlate this increase in fires with the decrease in timber harvest. That’s a rather dubious comparison that doesn’t hold up to scrutiny. Denney didn’t seem to have a coherent response other than to say that there still might be a chance that the United States might hand over the lands to Idaho. After discussion was done a motion was made to send the resolutions to the floor of the House for debate and a vote. On a party line vote the motion passed by a vote of 13 to 3. What was left unsaid was the underlying motivation to strip all environmental protections from the newly acquired lands and restrict public participation and their ability to litigate on behalf of environmental values. There is no process to do this under current state management. Most of the groups who want this transfer despise NEPA, FLPMA, NIFMA, APA, the Wilderness Act, and the Endangered Species Act. They don’t want these lands to have any protection and they don’t want any accountability for decisions made on these lands. Simply put, they only see the forest for the trees. These protections are far too valuable to hand over to the state which has absolutely no motivation to protect the values that many Americans hold dear on these lands. Can someone speak to the approval system that would be required on the federal level for this act of stupidity to actually happen? Both houses have to approve or can a stroke of a pen bless this? I presume it must take an act of Congress? Sense tells me it must be long odds or it would have happened in several states back during Reagan or W.
This all would take an act of Congress, signed by the President, or his veto overriden by Congress. It would seem that there are not nearly enough votes to do this. However, I think a fairly large segment of the Republican Party office-holders in Congress have become radicalized enough (“conservative” is not really the word to describe them) that they are willing to provoke a deadly constitutional and economic crisis by their continuing erection of fiscal cliffs, sequestrations, possible or real government shutdowns, threats to default on the national debt, etc., that the President and the Democrats will give into them on some huge issue that is, nevertheless, publicly popular so to save the very country. This is most likely Medicare or Social Security, but it could be something like transferring the public lands to the states. We are seeing an attempt at a actual revolution led by one chamber of Congress, the power of the filibuster in the Senate, and a one vote majority among the 9 members of the U. S. Supreme Court. I listened to President Obama’s speech in Jerusalem today. It was one of his best speeches and made some important points that we as environmentalists should use back at him with regard to pushing on such issues. In the speech he challenged the people of Israel to push their politicians for the things they want for their country, i.e. peace and harmony with Palestine in their case. We should use that page of his speech and flood his office and others with what this country needs for the environment such as a Continental National Park that stretches from Canada to Mexico, a national predator protection law, abolishment of Wildlife Services and so on. He told the people in Jerusalem that politicians including himself will never do anything challenging unless pushed by the people. Find his speech of today and listen to or read it and join me in letter writing to our Washington leaders including President Obama to wake up to this country’s environmental needs and challenge them referencing his own words with specific tasks to do just that. It is all for naught if we never act beyond writing on this fine blog. great points Larry. and thanks Ken for this chilling report. This seems the trend in Idaho, (across the US) the rational speak up and are defeated by radical extremists as quickly as they speak. Wow! Thanks for such a thorough essay. I love Mr. Medberry’s description of the resolution as “a piece of art, convoluted, inaccurate and bizarre.” Are you sure that this isn’t just a piece of absurdist performance art? It’s amazing that Idaho’s own Constitution virtually precludes Idaho taking over federal lands, yet they’re citing it in support of this resolution. Larry, if I’m not mistaken, National Forests are what they are because of enabling legislation from the US Congress. Someone else would have to weigh in on that. Basically, Congress could probably vote to give federal lands to the states. As Ken points out, the primary motivation is to be able to cash in by selling these lands off, not keeping them as Idaho’s own public domain. It’s the only way it even remotely makes sense, and it would give a quick hit of cash. Then what? Simplott, Don Peay, Koch Brothers, you name it, would own all the land, and us peasants would be locked out. Quality of life in these states would plummet if we could no longer access the mountains and deserts and wild rivers. My home state of Missouri was bought for us by the federal government as the Louisiana Purchase. Best I can piece together, it was a bit of a free-for-all for awhile there as people just set up homesteads wherever they could elbow their way in and hold onto the ground. Congress set up a process for orderly dispersal of these lands in 1841 with the Preemption Act, which sold land at $1.25 per acre to “squatters” who had lived there at least 14 months. This was replaced by the Homestead Act of 1862, which just gave the land away to those who lived on it, but they had to be there five years (or, six months if they paid $1.25 per acre). As Ken points out, there was a lot of the West that never appealed to anyone for homesteading, so it just sat there. Missouri was a different story, because virtually the entire state is useful for agriculture. Long story short: Sorry, Idaho, you had your shot at those lands fair and square a long time ago, and you passed. The US gained control of Idaho in 1846, so there was plenty of time to privatize all that land way back when. By the way . . . what’s a good way to describe a system wherein the federal government provides — either through taxpayer-financed purchase or military might or diplomacy to wrest it from competing governments — very cheap or even free land to people??? We need a Continental Divide National Monument from Canada to Mexico connecting all the wilderness areas and existing national parks for one uninterrupted ecosystem. That could be done with the stroke of a pen. If TR were here now he would do it in a heartbeat. What better honor for this country than to preserve the headwaters that flow to each side of the country. Oh I know he wasn’t a saint but I forgive him for those transgressions. I just like to ponder what he would be like if he could come back again now for just 4 years. Even though he was a cowboy then I have to believe cowboys now would be puckerin’ and peein’. I decided not to testify, partly because I didn’t spend time preparing any remarks, but also because I didn’t think I would be able to hide my utter contempt for these people. now Ken, there you go being politically correct again…. The federal government should immediately stop giving these whining hypocrites 21% back in taxes than what they put in. They must think everyone is stupid or they are just plain stupid. Maybe they could ask Don Peay to move to Idaho and they could take even more money out of the school’s to help Don privatize wildlife in another state. So it would be interesting to see how much this gooney bird, Lawrence Denney (R-9, Midvale), received from the Idaho Sportsmen for(some) fish and (some)wildlife, and if he has Idaho’s whore for that organization, Nate Helm, on speed dial. By the way I would bet ol Nate is trying to figure out how he can cash in on the gravy train the same way his panderer Peay did in Utah. Of course this is just my considered opinion. His major influncers are the Koch Brothers. He is tight with their organization ALEC that writes these laws. These folks wouldn’t be able to control themselves if they gained ownership of public lands. I have a feeling the fronts would all fall away and we would bear witness to the ferocity of unrestricted greed. I attended a presentation by American Lands Council Spokesperson and Idaho County Commissioner Jim Chmelik the other night in Grangeville. He said the state is a much better manager of public lands. He said the forests are in critically poor health. And he said we should be building roads on steep terrain to access timber. Of course, he cites absolutely no sources for these assertions. Faith is reality, right? What would the NRM look like in 30 years if these parasites were able to get their way? What kind of cretin do you have to be to not realize what a gift these public spaces are, and what would happen to them if they were controlled by the lowest common denominator? It comes as no surprise that Idaho politicians would come up with a hair brained shceme like this. Especially when you look at their politics concerning wolves. They are one of the worst states on their wolf management tatics. They are blatant in their prejudice for the wolf. Why they chose to regard the wolf as an enemy instead of a ally that could bring millions of dollars in revenue to that state through ecotourism is a question only a prejudiced idiot could answer. “very important health care programs” Really? Isn’t obama care going to take care of that for everyone? A let us tax payers provide for every welfare loser who rides the obama give away program. Not be able to select Doctors of your choice,pay more money for less coverage. Yeah It’s very important and his plan is a loser! It’s a Fu$&ing joke! You seem to have anger management issues. You may want to see a therapist. If the Idaho legislature would focus on things like public education funding, or lack thereof, (and you clearly are a result of that lack of funding)instead of the eradication of wolves and this National Forest nonsense, maybe Idaho could then sit at the adult table. Craig, if you are from Idaho, take your FoxNews/Rush Limbaugh fueld anger and direct it toward your state legislature instead of coming here and ranting. The Idaho Department of Health and Welfare has been gutted. Programs that actually save lives have been eliminated or drastically cut by Republicans in this state. Programs even have to ask permission from the governor to write grants for federal money. By the time they get permission from him it’s too late to apply so they don’t even bother. That’s the Fu$&ing joke you moron. People die because of this. We were thinking along the same lines. You were a little more succinct than I was. Your comment posted while I was typing mine. Being off topic from time to time is to be expected, but ignorance-driven drivel that’s off topic doesn’t really have a place here…in my opinion. I am moving to SE Idaho in a couple of months. The grass doesn’t seem that much greener to where i’m headed…thanks for this post, though. It is good to be educated. Zach, I’ve never lived there, but I spent half a day in Idaho Falls recently. Happy to report a quirky, thriving downtown. Seems like an interesting place, and it’s just over the hill from the Tetons, a quick jaunt to the Big Desert, and lots of solitude in the Lemhi and Lost River Ranges. The Driggs area is quite lovely, too. Don’t be alarmed or totally put off by the outsized influence of a particular cultural group there. Most of them are very nice people, quite devoted to their families. We ask ourselves, “will they never give up on this nonsense?” In reality, many of the proponents just grow old and die (or die in car crashes not wearing seat belts), and then new players hit upon the same goofy idea later on. Makes no more sense to give it to the state of Idaho than it would to give it to the state of Kentucky since neither one has any legal claim to it. It belongs to all citizens via the federal government–to me as a citizen of Iowa as much to a citizen of Idaho. I should add–an obvious flaw of any republican philosophy of giving this away: if the federal government is as broke as they say, how on earth is it fiscally responsible for the federal government to give away assets? Over at Salon this morning, Michael Lind points out a larger trend of “rich moochers” and their strategies of greed. As with roads — collectively financed societal goods — wildlife, mountains, open space are things we’ve all invested in maintaining over the centuries. Now these greedheads want to grab it and lock it up so they can control who has access. To add insult to injury, part of their sales pitch is that these public resources are in bad shape, and only parasitic crony capitalists can do a competent job of “managing” them. I am just aghast that this issue even came up in our State Legislature. I applaud Rep. Woodings (Dist. 19) for pointing out that it is contrary to the Idaho State Constitution. Idaho’s federal lands are a treasure and need to be seen as such. To allow transfer to the state, would just lead to selling them to the highest bidder, without any regard for the environmental impacts that could ensue. This has ALEC footprints all over it. I want Idaho’s wildlands to be protected. Given the State’s inept handling of other things, for an example – education, the last thing I want them to have jurisdiction over is our public lands. I believe that this will never happen and that the democrats will never let it happen. Even if there were to be an actual chance of it happening I believe that enough people would rise up and protest and disagree with this idea that congress would back down. I know that the support for public lands from people who enjoy them will defeat those who support this idea. If you really disagree with this idea then get involved to stop it. One more thing this idea has a very hard time passing the states let alone actually happening. Arizona was defeated twice,Colorado tried twice and failed twice,New mexico tried and failed, and a Wyoming senater wanted to try to pass a bill to demand federal land in Wyoming but the attorney general of Wyoming said demanding it wouldn’t work so instead they passed a bill to ” study it ” and find other ways to convince the feds to give it to them. Finally Nevada is interested in it but has yet to actually do anything and the guy from utah who convinced idaho to try it offered to give his talk to Oregon and Washington but they didn’t want to hear it and didn’t invite him over to their states. So if only one state( Utah ) has actually demanded it and the rest who tried failed How will it even pass in congress with the odds impossible there. Even if Idaho passes it two states is hardly enough to create enough of a political movement to actually get anywhere with this idea. Dameon, I certainly hope you are never proven wrong on this. I tend to feel the same way however, all it takes is a tea party majority and a rider (as in wolves exempt from ESA) and we are toast. I dare not find myself complacent for fear of these wingnuts. The movement to push for the Fed’s to turn over land to the states is not going to stop, there are many states that keep proposing this and I think it will eventually start to happen. The Fed’s are having more and more trouble administering Federal lands in many areas and all it is going to take is once for it to move forward and then the gates are going to open, I don’t think the future looks very bright for the Federal Government right now. A lot of things seem to be falling apart at the Federal level. Time will tell how this all pan’s out. I know Texas has pushed back, Montana has a legislation that has passed to push back, Arizona has done it, Now Idaho, there seems to be a strong ground swell for this type of action all over the country. The future could become very interesting. If this asinine action ever comes to be it will truly be the burning of the furniture as Aldo Leopold I am sure would say. Not sure what kind of medication I would have to take to try to survive the depression. I have worked with Federal agencies for many years now, including my first career, which was with the army for 26 years and now as a biologist who worked for a state agency, I just don’t see many good things happening, I am glad I am in the latter part of my life, because my confidence in the future is pretty low after what I have seen. I totally agree, SB. I haven’t got a whole lot of confidence in the future either! The interesting thing is that I have never heard very much talk about the State of Montana taking over federal lands in Montana. I do not think the the majority of Montanans would be for it or allow it. They have not pushed to take over lands, but our last two legislative sessions, there have been bills introduced to not enforce Federal Laws, so I fear it is just a matter of time. I can not claim to fully understand all the facts or feelings wrapped up in federal land title in Idaho or the Rocky Mountain West in general. Here in Virginia, where admittedly the percentage of federal lands is far less, we generally treasure the national parks, federal monuments, and other federal lands. Perhaps Idaho (and other states) would have a better chance of gaining title to some lands if they were not so transparently trying to undermine any and all conservation efforts and merely trying to maximize agricultural and business opportunities. It takes some semblance of balance to try to accomplish major changes! Sadly, I am far from surprised. I could voice disappointment with our government on many levels. Expecting a president to change things is a waste fo effort. I firmly believe that without a third party in the running on local, state, and federal levels we will be in a constant flux. The environment, public lands, and resources that aren’t pumped into tanks are so low on the list of priorities that progress moves slower than a snail’s pace. I believe people are largely undereducated about who controls what, where money comes from, how the whole system works. The less they understand, the less they know, the less they care. To make major changes, you have to change the way people think, and wha they value. That starts on a personal level, but for most people, it begins and ends in their wallets. Anyone who thinks this is a good idea, please visit the Floodwood State Forest. Dan: I’ve never been to Floodwood…can you elaborate? I believe that he is referring to Idaho state endowment lands that contained an ancient grove of western red cedar which was logged to raise quick cash for the U of Idaho. It would probably have better served the state left as an example of a nearly liquidated resource. We’re probably at odds on this issue, but I’m not sure because I’m more or less on the fence. I typically am for anything that shifts control from the federal level to the local state level, but this is a little more tricky because I love our federal lands. I love hunting, fishing, hiking, and exploring all of our public lands – from the dry, hot Owyhees to the cool top of Council Mountain. I wonder though, wouldn’t the state stand to lose a pile of money if they tried privatizing land? I mean they gain a lot in revenue from recreational users, I would guess. Most hunters can’t afford to hunt private land, so if the public land goes away, license and tag sales would drop dramatically – isn’t that all state money? And wouldn’t that be enough to discourage the sale of massive amounts of land? I realize I’m in way over my head – I try and steer clear of politics because I dislike confrontation… i.e. I’m a pansy. The main reason I wanted to comment anyways was that this article was full of opinions that contradicted my own, but this line was awesome even though it is a zing to my own beliefs: “Simply put, they only see the forest for the trees.” Clever, funny, and to the point – well done. One doesn’t know what one has until one does not have it any more. Just ask a Texan that is an average wage earner and has to compete with the hoards of hunters on the minimal blocks of public land because they can’t afford the pricey land access fees. With a narrowing of access comes tighter regulations in order to keep the hoards of users from overuse and over competing with each other. I can tell you that even in Idaho with all the public land it is very much more crowded now than it was in the 50s. Every inch of public land lost equals packing users closer together. Transferring federal public lands to state public lands will increase the pressure on state administrators to twist the land use toward commercialization to try to satisfy the ever depleted state coffers. How much access does the public have to Payette Lake at McCall? A few little public token access points and the rest is enjoyed in privacy by those with money or well connected to get the favored leases. One of the advantages a senior person has is that they can speak from experience. I offer my expert testimony, I know you don’t want to lose your Idaho federal lands if you like elbow room when you hit the trails.